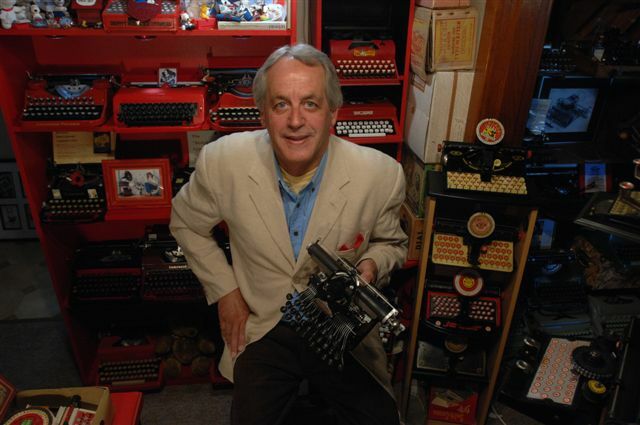 Anyway, it got me thinking about typewriters, painting and the surname Lentz. Why? You may well ask. Well, I’ve been doing a bit of typewriter painting myself this weekend. It's seldom other than frustrating and time consuming. But not gouache on paper - or acrylic on cardboard for that matter - but primer and lacquer on metal: a real typewriter, that is. Whenever I do this, I always think, “There has to be a better way”. Most especially – indeed, almost exclusively – when it comes to painting the paper plate the same colour as used on other parts of the typewriter. Anyone who has ever repainted a typewriter will know exactly what I mean. 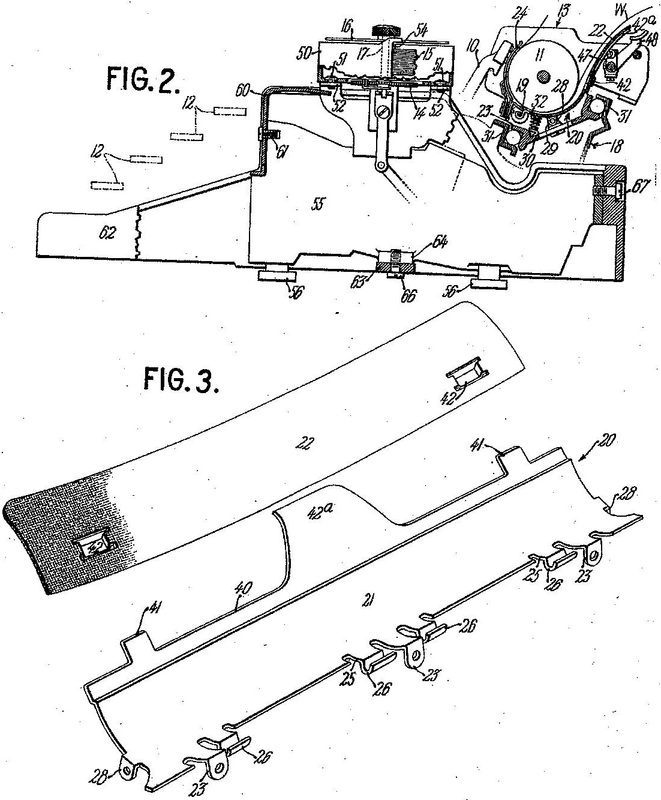 Another member of the Lentz family thought about this, too, and 84 years ago last week (April 18, 1928) Lawrence E. Lentz (born September 1886, Baldwin, Allegheny), of Harrisburg, Pennsylvania, applied for a patent for an idea to overcome the problem. 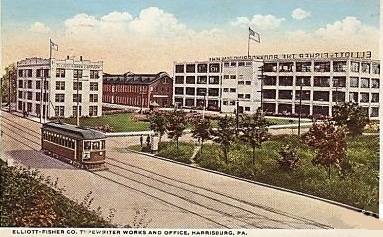 Lentz, who was service manager for Underwood Elliott Fisher at its Harrisburg typewriter factory (below), described his “invention” as relating “generally to portable typewriting machines, and more particularly to means suitable for use by typewriter dealers for finishing such machines in various colours”. Here is a man, I thought, after my very own heart. 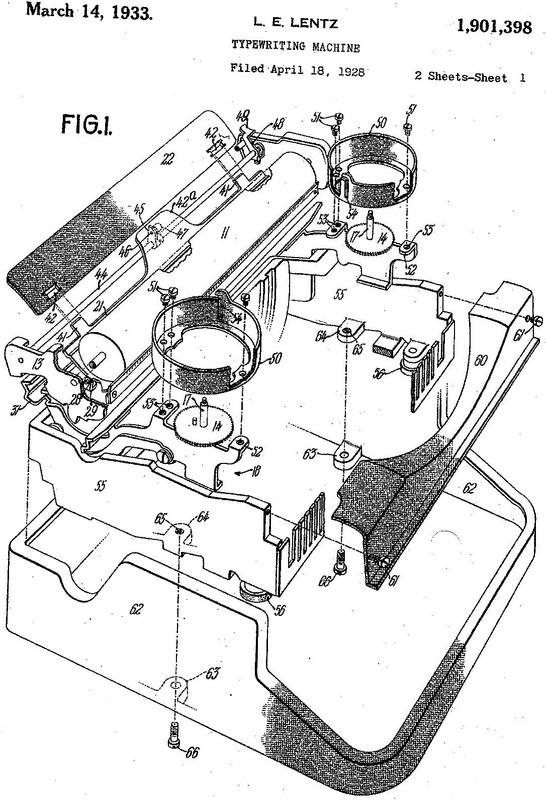 Lentz, applying himself to the wonderful Underwood 3, said, “The typewriting mechanism is mounted on an inner unfinished main frame. “There is provided a mask or dress constructed for easy attachment to any typewriting unit by simple fastening means. All of the parts of a typewriter dress are finished in the same colour and are simple in design and easy to manufacture. “It is a feature of the present invention to construct the rear paper-table to include a lower and an upper section, and to apply a coloured or dress finish to the upper section alone, which is the only portion of the rear paper-table that is in full view. “The lower section of the paper-table is permanently attached to the platen-carriage to form a part of the typewriting unit. Simple means are provided whereby upper sections of rear paper-tables may be interchangeably fastened to the lower section of any typewriting unit." Gee, I wish this idea had been taken up! You know..... It seems you an I have had the same problem this weekend. I've been scratching my head about how to tackle painting the exact same component. I'm at least trying to tackle a standard typewriter myself, which in its own right creates a a few other problems - Mainly the lack of separation of the body from the mechanical structure. - (Insert swear here) this better have good results. Having said that, the paint I'm using cost me almost twice what the typewriter cost. So it's an interesting experience all up. I think you and I will have to compare results in the end. Although I think Mr Polt's flaming purple torpedo (does he have a name for it yet) might be hard to beat. The things that get patented amaze me. I suppose this was an innovation, but I wonder how long it took for other companies to get around this particular patent. Thanks for the informative story. Good luck with your repainting project!